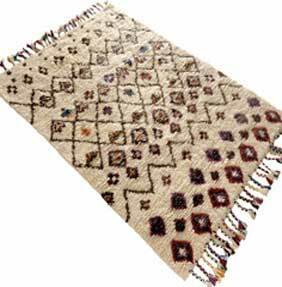 Nomadic Design rugs have their origin in North Africa, nomadic people have woven rugs similar to this for thousands of years. Even today these fascinating works of art are woven and sold to western buyers, they are a way of life and survival for many nomadic families. This collection is reproduced in Indian from 100% pure wool, each rug is carefully hand-woven to give individuality and character. The powerful designs are geometric in layout and represent the original Africa rugs. The designs vary in price, this is due to the pile weight which vary from 2kg /m2 to 4kg/m2.